Few things are more likely to make someone overreact than an irrational fear. That is why, during a work-related visit to a hotel and casino (seriously - work related), one of my most prominent irrational fears got the better of me. My plan upon checking into the hotel before our company meeting was to drop my belongings off in my room and bring some lunch back to relax for a bit. Once I figured out which set of elevators went to my floor, I pressed the Up button and waited for one of six to show up. A set of doors opened and I entered, pressing the button for the 31stfloor. The doors closed and I thought I was on my way, but the elevator didn’t move. Now there are two things I know about elevators. First - on that rare occasion, they can malfunction. Second – though for the most part I am a rational person, getting stuck on an elevator is high on the Richter scale of my irrational fears. I pressed Open Door and stepped back into the lobby. No motorized casket wannabe was going to encase me for hours, especially with no ladies’ room accessible. Pressing the Up button again, I took a chance on another elevator. Same thing. No movement. The second time I hit Open Door and skittishly abandoned ship, but this time I followed someone onto another elevator. Once the door closed, the other hotel guest casually waved his room key in front of a magic box on the wall and pressed the button for his floor. Being a failure at reading directions but quite accomplished at riding on others’ coattails, I hit number 31 for my floor - it didn’t stay lit. My co-passenger told me to wave my room key in front of the magic box so it could verify that someone had a key for that floor. Ohhh, so that’s how it works, I was thinking while simultaneously praying I never ran into this person again. By that time, I was really hungry. Taking the elevator down to the lobby was much easier, so I made my way to the food court for a sandwich. On my way back to my room I boldly flashed my room key across the magic elevator box and pressed my floor number. My sandwich and I made it unscathed to the 31stfloor. If you’re wondering where my fear originated from, I don’t know the answer to that, but I do know it was already going strong when Spouse was just Boyfriend. One day during our courtship, we had ventured downtown and parked in the upper floor of a ramp garage. 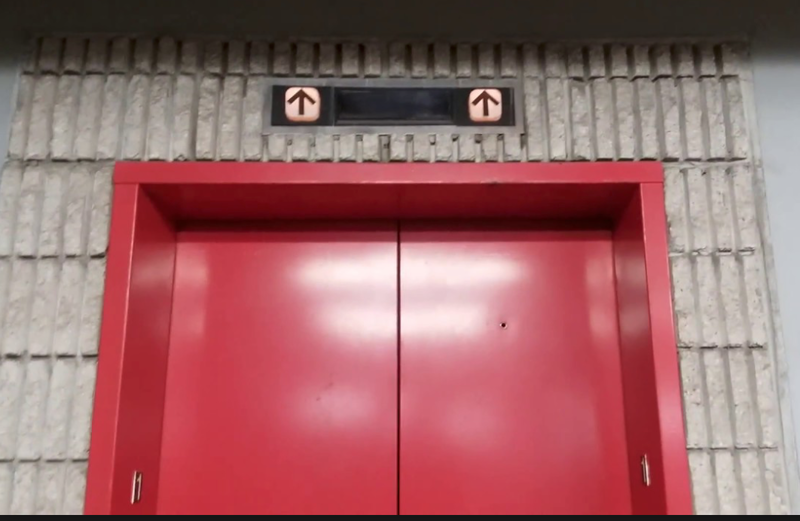 We were on the elevator heading back to the car, when, for some unknown reason, Boyfriend thought it would be super cool to force the elevator to stop between floors by pushing the inner door open. Mind you, it was one hundred percent NOT because he thought it would result in a romantic scenario. Nothing was going to happen on that rancid, urine-stained, blackened ashtray of an elevator. This was just some spur of the moment, testosterone-filled, stupid-boy idea that seemed funny at the time – until he turned and saw my face turning gray. The thing is, Boyfriend had injured his shoulder just a few weeks before and was supposed to be taking it easy. I didn’t care if he pulled that flipping door closed with his teeth – he was going to get us out of there if he died trying. I’d still remember him… as that stupid boy who made the elevator stop. Fortunately for Boyfriend, he managed to persuade the doors to close and the elevator to move again. I wouldn’t say he saved my life, but he may have saved his own. A couple of weeks ago, Spouse and I celebrated our 34thwedding anniversary. Yup, I kept him around even after the elevator debacle. He’s just never been allowed near an elevator door for 34 years.